In a fast-changing world, can cities be built with long-term perspective? By 2050, at current rates of urbanization, the world will be two-thirds urban and one-third rural. Most of that growth will occur in Asia and Africa. Those regions are expected to receive an additional 1 million inhabitants every week for the next 40 years. While most urban expansion will take place in Asia and Africa, cities across the world are in different states of development and face different challenges. Greenfield urban experiments in Asia, Africa and the Middle East are serving as test beds for addressing environmental and sustainability challenges. Some of China’s newer cities, such as Zhengdong New District, are beginning to fill up, suggesting that what were termed ghost cities by the international press were actually just cities slowly coming to life. While planned urbanization has its challenges, unplanned urbanization in these regions has its costs as well. Subsisting on informal economies, some slums have become ungoverned and unserved cities within cities. The idea of inclusive urbanization, whereby all citizens share in the benefits, is gaining traction but will require political commitment and innovative mechanisms. Policymakers and the public have tended to favor new projects, but maintaining and upgrading existing infrastructure is also essential. Extracting additional value from existing assets, whether through optimization or creating new revenue streams, can be an alternative to building new infrastructure. Innovation is helping to solve the challenges cities face. 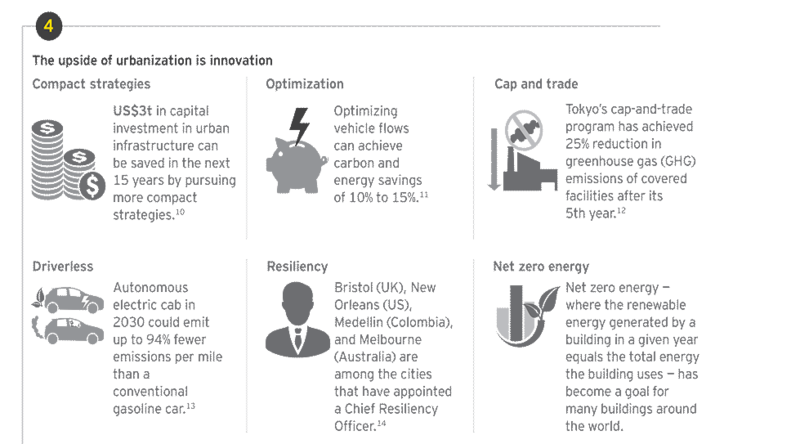 Urban residential and commercial customers are generating more of their own energy and getting more of their power from distributed renewable sources. The Internet of Things holds promise for cities to become “smarter.” Innovation to reduce the cost curve of infrastructure is helping cities to become sustainable and more habitable. Successful urban solutions will entail public and private cooperation. Meeting the challenge will require the creativity and investment of the private sector alongside the long-term vision and funding of the public sector, as well as a dedication to inclusive growth. Within decades, cities are likely to become as powerful, if not more so, than nations themselves. Local city governments are better positioned to understand the specific needs of citizens and tend to be pragmatic (and less driven by raw politics) in their approaches to urban challenges. The potential for megacities to emerge as the world’s most important economic entities will have profound effects on future geopolitics, governance, and corporate plans. How can cities become big and successful, not just big? World Urbanization Prospects, United Nations, 2014. State of the World’s Cities 2010/2011, UN Habitat, 2010. 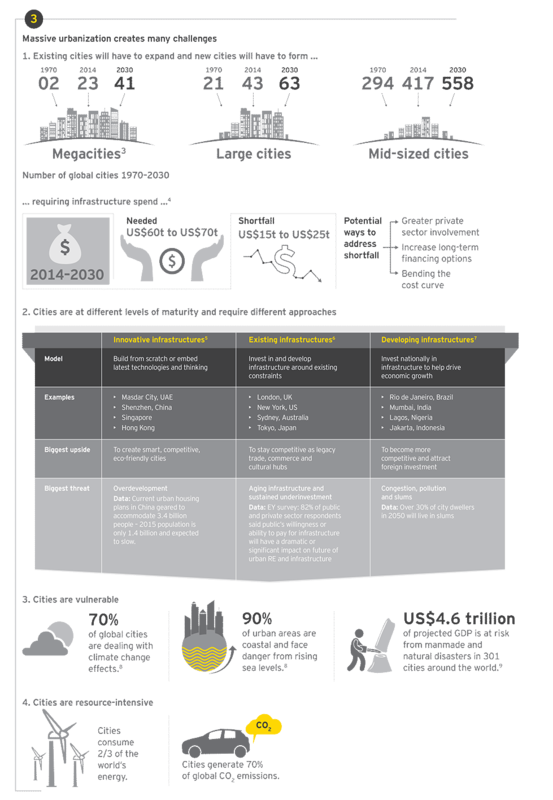 B20 Infrastructure & Investment Taskforce Policy Summary, B20 Australia, July 2014. “China is Still Building Ghost Cities,” The Diplomat, 19 October 2015. 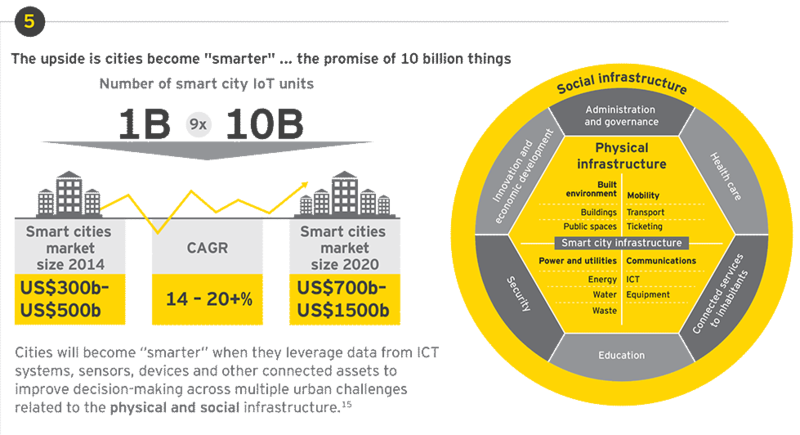 Infrastructure 2014: Shaping the Competitive City, EY and Urban Land Institute, 2014. Sustainable Development Challenges: World Economic and Social Survey 2013, United Nations, 2013. Why Cities: Ending Climate Change Begins in the City, C40 Cities, 2016. Lloyd’s City Risk Index 2015–2025, Lloyd’s, 2015. Cities for People: Insights from the Data, Energy Innovation, April 2015. The Route To Carbon And Energy Savings: Transit Efficiency In 2030 And 2050 — Final Report,Center for Neighborhood Technology, Chicago, November 2010. “Tokyo Cap-and-Trade program slashed GHG emissions by 25% after 5th year,” ICLEI, 3 January 2016. “Electric 'robocabs' would reduce US greenhouse emissions by 94% — study,” The Guardian, 6 July 2015. “2nd Annual Chief Resilience Officer Summit Begins November 9 in Mexico City,” 100 Resilient Cities, 6 November 2015. “Gartner Says Smart Cities Will Use 1.1 Billion Connected Things in 2015,” Press Release, 18 March 2015. “Percentage of Public Debt in GDP Around the World,” Global Finance, 6 May 2016.